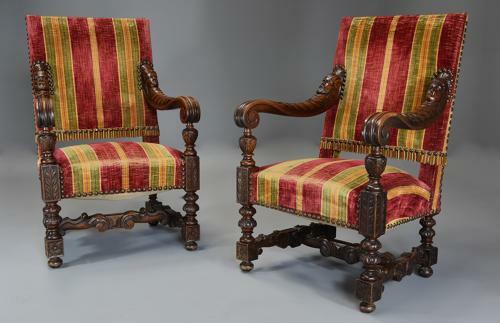 This striking pair of chairs consist of an upholstered back leading down to superbly carved scroll arms with carved male and female heads supported by turned and carved baluster arm supports with foliate carved block corners. The chairs are supported by turned and carved legs joined with a shaped and carved H-stretcher terminating with block and bun foot. The striped upholstery is not original but is in good condition (with slight wear) and works very well with the style of the chair but could of course be changed once purchased. This pair of chairs are in excellent condition for age, are of stable construction and can go straight into a home.